This is an IHRSA featured article, brought to you by TRUE Fitness. You may be familiar with the “leaky bucket theory” taught in some business schools. Say you have a bucket of water, but the bucket has a few holes in it. To keep the bucket full, you need to increase the flow of water or plug up the holes. The leaky bucket theory is a perfect analogy for the underlying dynamics of customer retention. To keep your customer base stable or growing, you have to increase acquisition (the flow of water into the bucket) or prevent attrition (plug up the holes). Water, of course, isn’t an infinite resource. So, you need to plug the holes. And some holes are bigger than others. Member attrition is otherwise known as “customer churn,” and health club owners understand this concept as well as anybody. And they also know that acquisition is more expensive than retention. This is true in any type of consumer business. Acquiring a new customer is five times more expensive than retaining an existing one, says a survey by Invesp Consulting and Forbes Insight. Data compiled by IHRSA show that a health club member who doesn’t renew a membership can cost a club $674 in annual revenue. That’s an expensive leak. IHRSA research has found that club operators spend an average of $118.65 in marketing and sales costs for each new member. Refilling the bucket is costly. It’s time you got a bigger bucket. Longtime members are the group most likely to become dissatisfied and convert from promoters to detractors. The risk of cancellation was 56% higher among members who just use gym equipment vs. those who exercise in groups. Jay Ablondi, IHRSA's executive vice president of global products, sums it up nicely: "Results show that any type of interaction with a member at risk of canceling can reduce the likelihood of dropping out by nearly 10%." You have to keep your members interested and involved. Personal interaction, whether by club staff or other members, makes a huge difference. That’s why developing group training is so valuable to clubs. As the 2018 IHRSA Health Club Consumer Report determined, members are less likely to quit their club if they’re involved in group training. For clubs looking to increase their group training options, small group training (SGT) is a good place to start. Not only is it easier to organize and coach, SGT creates stronger opportunities for social cohesion. It’s a more intimate dynamic. Perhaps that’s why SGT is gaining in popularity. IHRSA’s Profiles of Success reports that 18 million health club consumers signed up for SGT in 2016, accounting for 26.6% of the total consumer base. It’s a retention tool that you can take advantage of for minimal cost. Keep this in mind when you make your next equipment purchase. 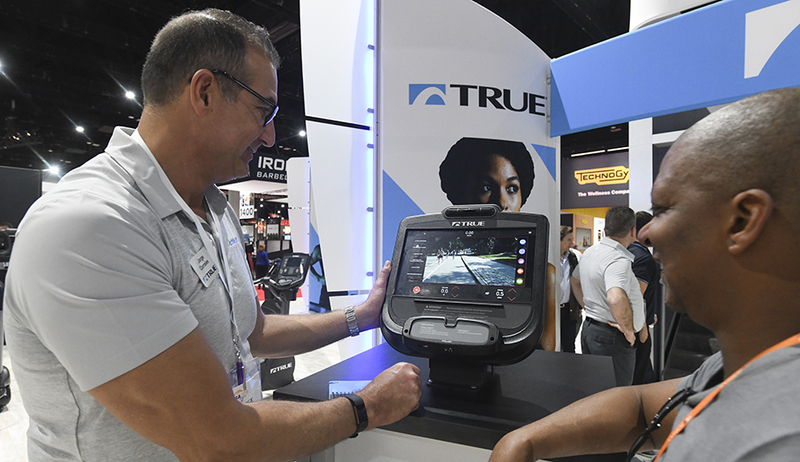 According to the IHRSA Health Club Equipment Report, 73.2% of club owners said that retaining members is the primary objective of buying new equipment. If you’re going to invest in new equipment, you don’t want to just replace something you already have, especially if it’s one-dimensional. To really increase retention, you need a unit that can accommodate SGT. A TRUE Fitness representative talks about equipment at IHRSA 2018. That’s a tall order, but the payoff is worth it. Multi-station group training units allow for increased revenue streams from SGT programs. And it allows you to offer the advantages of SGT without forcing you to reinvent your floor plan. That’s the idea behind the Atlas Group Training System from TRUE Fitness. The Atlas is a space-efficient, multi-station group training unit that’s specifically designed for today’s SGT programs. The Atlas is fully customizable and can accommodate all fitness levels and facility budgets. The Atlas is available in two versions: The Atlas 200 and Atlas 201 models. Both come standard with a step platform, dip station, white erase board, and rope rack. The 201 has three flat trays and five medicine ball rings. The 200 has an accessory rack with hangars, two flat trays, and five medicine ball rings. Additional storage options are available, as well as BOSUs and foam rolls. The versatility of the Atlas allows for any number of fitness programs, from HIIT to simple circuit work. TRUE Fitness can help you set it up and suggest programming options, and can help train your PTs on how to get the most out of the unit. TRUE also offers all of the accessories you need to make the unit work: suspension rackets, heavy bag attachments, resistance tubing, medicine balls, core trainers, battle ropes, and more. The Atlas is versatile and protean state-of-the-art SGT unit that will help you develop SGT options that will engage members, create more social interaction, and offer different levels of revenue possibilities. And you can customize the unit for your space and program needs. It gives you a tool that can help you keep new and long-term members engaged and involved. The Atlas is an SGT equipment option that’s versatile enough to work for big-box clubs or boutiques. Use it to full advantage and you may soon find that your bucket is overflowing. To learn more about the Atlas, visit the TRUE Fitness website. Also stay up to date with TRUE by following them on Facebook, Instagram, Twitter, and LinkedIn.